Today's SUN (20181206) | AR12729 (added video) - SolarChat! Last edited by pedro on Sat Dec 08, 2018 8:09 pm, edited 2 times in total. Excellent granulation and sunspot images, Pedro ! Last edited by pedro on Thu Dec 06, 2018 10:15 pm, edited 1 time in total. A fine set of images, Pedro. Lots of nice toys to play with too . A great collection to look at there Pedro. That new scope looks great too. 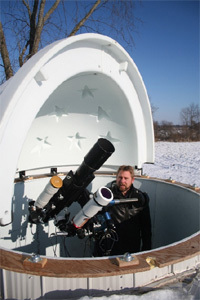 Congrats on your new scope...that should give you some great views and images!!! Always very nice to see your setup. Nice collection of images. Looking forward to see images from the APM.